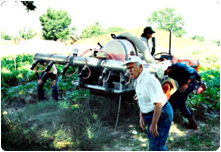 Wally Tharp, former President of Perma-Guard™, spent the last 52 years of his life spreading information on the agricultural use of Diatomaceous Earth around the world both as an anti-caking agent to preserve feed and as an insecticide. He logged thousands of miles in the early days traveling the country visiting farms and homes towing a trailer loaded with Diatomaceous Earth and spraying equipment. He felt the average homeowner or farmer could protect their home and property without endangering the health of their family, their livelihood or contaminating the earth. No special experience or fancy equipment was required. Once one attended one of Wally's meetings there would be no doubt where newcomers to the world of Diatomaceous Earth received their information. 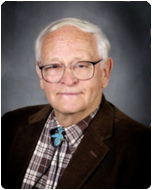 Wally was an avid gardener and “health fooder” initiating the first food and health group meetings in the city of Albuquerque. He was the consummate salesman and blessed with the ability to make a friend wherever he happened to be. He and the Perma-Guard™ company, with the invaluable help of his business partner, Merv Haney, have made the product known around the world. Wally passed away at age 89 leaving Merv to don the public persona of ”Mr. Perma-Guard”. No longer in the background, Merv has continued to spread the word about Diatomaceous Earth. He is instrumental in the creation of new Perma-Guardproducts designed to help crop and garden production with an eye on sustainable farming. Merv has recently appointed his son, Mike Haney, as President of Perma-Guard while he continues to focus on new products and international development.